▀You can sponsor a student. The cost is $15 USD per month and $200 USD per 9 months full training package of MS Word, Excel, Publisher, Pagemaker, Powerpoint programs. 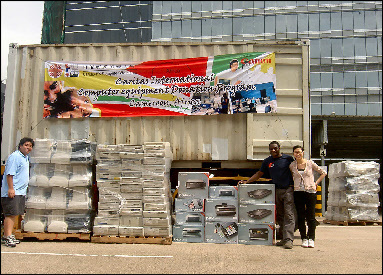 Computers may be donated at any point on the globe but we still have to pay import duties and shipping charges. We'd appreciate your help. Occasionally we are offered late model computers at "bargain prices". We hate to miss out -- but we often don't have the funds.